The Ohio Department of Natural Resources and the City of Columbus are teaming up to improve boating and fishing access at Hoover Reservoir. Improvements will be made to the existing Oxbow Road access area in Delaware County, the only boater access on the northern portion of Hoover Reservoir. The access area currently consists of a primitive gravel launch ramp and parking lot. The scheduled improvements include widening the access road; installing a sidewalk; paving the road and parking lot; creating car-only and car-trailer parking lots; installing a concrete boat ramp with a floating dock; and providing new LED lighting street lamps. Hoover Reservoir is an important fishery in central Ohio, according to the ODNR Division of Wildlife. Improving the Oxbow Road access will help anglers access the excellent catfish and crappie fishing that exists in the lake. This project is funded by a state motorboat fuel tax, the federal Sport Fish Restoration Act and the City of Columbus. Construction is slated to begin later this summer. Once on-site construction begins, the entire Oxbow Road access will be closed to all traffic until the project is completed, which is scheduled for late spring in 2018. The federal Sport Fish Restoration program generates funds from an excise tax on fishing equipment. Projects such as boat ramp improvements exponentially increase the ODNR Division of Wildlife’s ability to reinvest in local communities. No state tax dollars are used for this activity. This is a user-pay, user-benefit program. Contact Carey Santiana at carey.santiana@dnr.state.oh.us for the Hoover Reservoir Oxbow Road Boat Ramp Improvement rendering. Visit the ODNR website at ohiodnr.gov. This image provided by the Ohio Department of Natural Resources shows the area where boating and fishing access improvements be made at Hoover Reservoir. The existing Oxbow Road access area in Delaware County, the only boater access on the northern portion of Hoover Reservoir, will receive an upgrade. ODNR and the City of Columbus are partnering on the project. 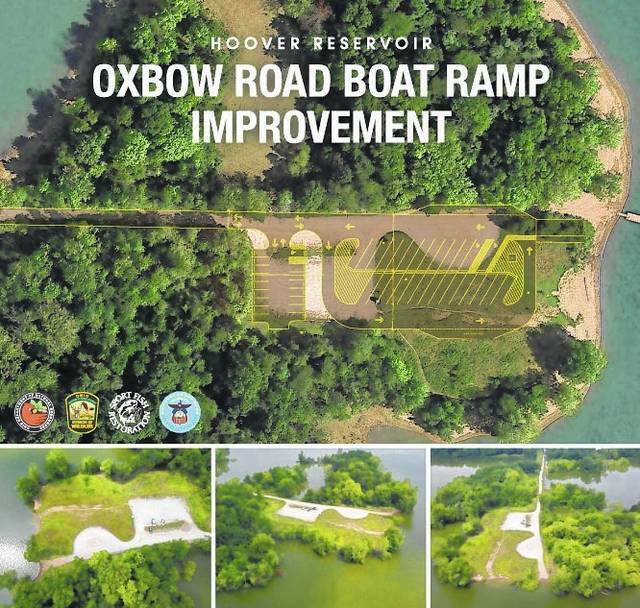 https://www.delgazette.com/wp-content/uploads/sites/40/2017/09/web1_Oxbow-Road-Boat-Ramp_Project-Plans.jpgThis image provided by the Ohio Department of Natural Resources shows the area where boating and fishing access improvements be made at Hoover Reservoir. The existing Oxbow Road access area in Delaware County, the only boater access on the northern portion of Hoover Reservoir, will receive an upgrade. ODNR and the City of Columbus are partnering on the project.